Gary and I attended our first Art course together! It was a fabulous weekend course at the Mary Ward Centre in London, UK called Mosaic taster course. It started on Friday evening 6-10pm and then continued onto Saturday 10-5. The teacher, Anna Sklovsky, is a very experienced artist in glass and mosaic. I found her very encouraging and supportive. She was quite intuitive in the way she encouraged everyone differently based on how they worked. On the Friday we were shown some examples of previous student work and techniques for cutting glass, mirror, ceramics and tiles. We had the choice of working onto glass, mdf or mirror. I chose to do my first project with a bronze coloured mirror on mdf so that I could mosaic a frame around it. On Friday I picked up bits of glass here and there and started to try to consider a design but it was a little frustrating. Luckily, I was had an epiphany whilst lying in bed! 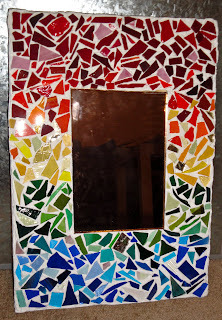 I suddenly had an idea for the mirror of a rainbow effect with glass with red at the top and blue at the bottom. I came in on Saturday knowing exactly what I wanted to do and was able to get on with it very quickly, finishing before lunch time. I am really pleased with the mirror that I have created, especially as it was my first ever attempt. I then had time to work on another technique. I found a few pieces of glass in interesting shapes and made them into a tree. I used pva to stick them to a glass tile and used pva with small pieces of glass to crate the foliage. It was like doing glitter pictures as a child! Even though I'm not as proud of it as my mosaic it was interesting to try out another technique. The resources on this course were fabulous. So much glass, ceramics, mosaic tiles, mirrors - too much to choose from almost! I now have designs on practically everything I see! 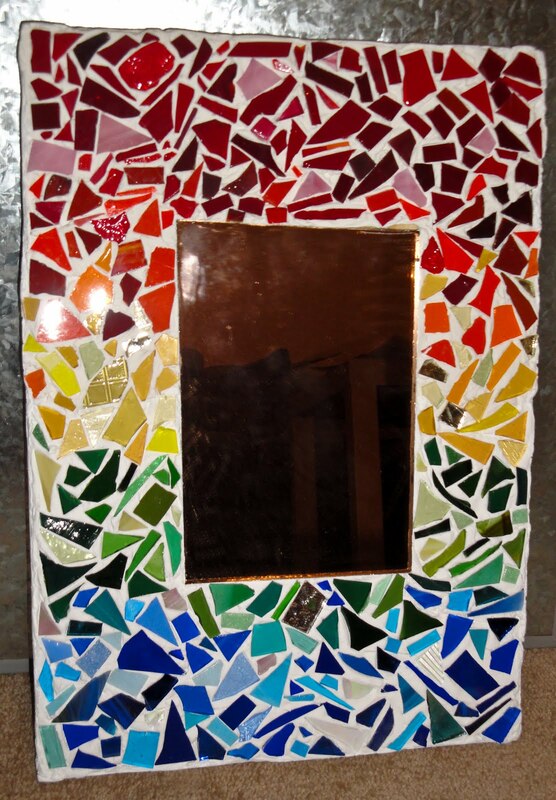 I would love to do some garden mosaic and have seen some great books on Book Depository. I wrote a list this morning of all the methods I have tried out this year and it is quite a lot! I do feel it is time to focus on one thing at a time. But it has all been fun!